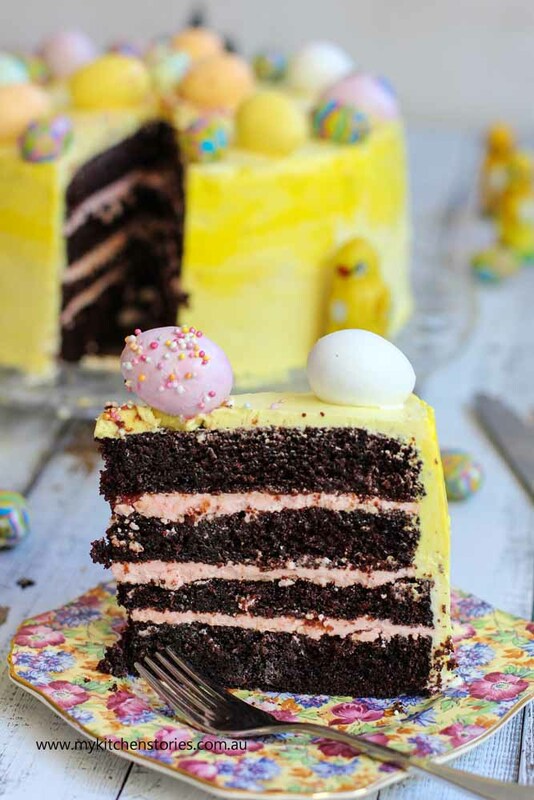 This is a Gorgeous Chocolate Cake with Easter Eggs, but anytime you want a simple one bowl cake, this is it! I know that this may look a bit tricky but I promise it is quite easy. It’s all in the decorating. Make it up to 4 days ahead and keep it in the refrigerator. Simples. Easter is on the way. 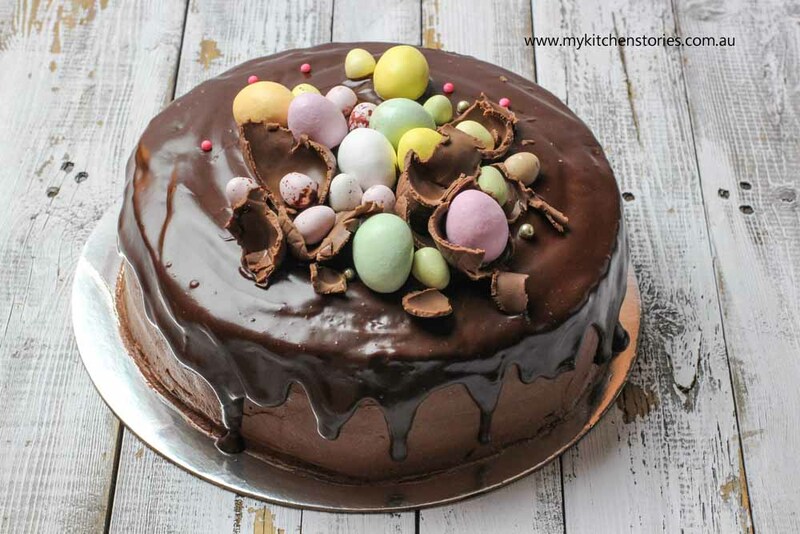 This gorgeous chocolate cake recipe is one you will want to keep. It is made by plopping everything into the one bowl and mixing. 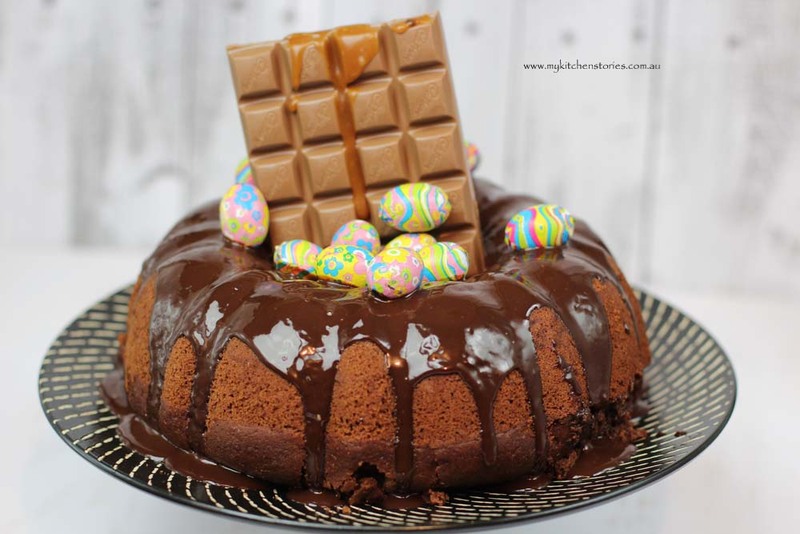 It is moist and it keeps very well as a layer cake or with a simple chocolate icing. 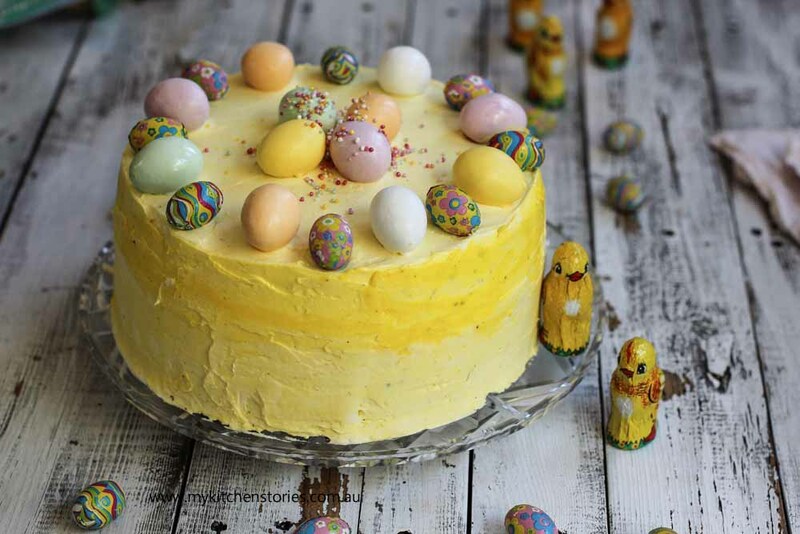 Once you have made the buttercream you just need to decide if you would like to keep it white or colour it and then decorate with lots of Easter eggs and sprinkles. Once completed refrigerate to set. Remember less is more. 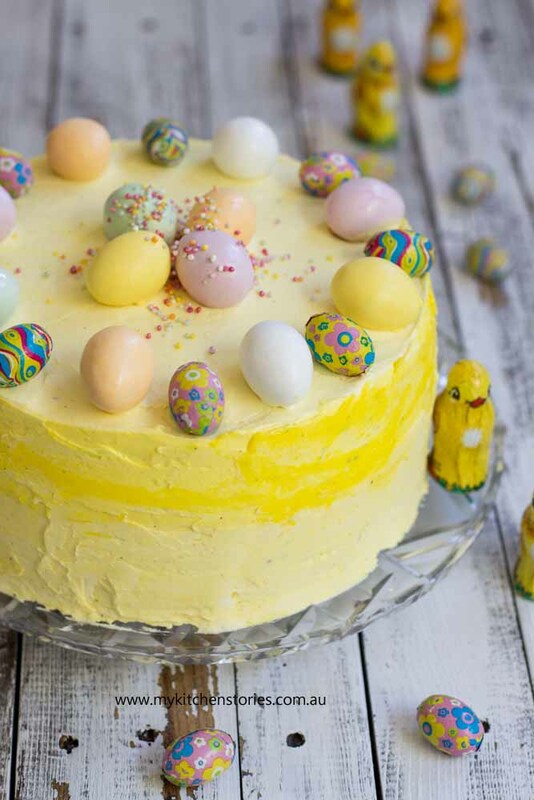 To make the perfect buttercream beat room temperature ingredients till light and fluffy. Use on your cake straight away and then chill once assembled. 3 Colours : I used yellow x 3 shades of paste and pink for the middle..
You'll need two spring form tins 20 cm (8 inches) set the oven to 180 C / 350 F.
Pour this into two lined tins and sit each onto a piece of foil (to stop leaks). Bake approximately 1 hour. It could take longer. Insert a knife into the centre. it should come out clean or even just slightly damp when done. Cakes are best chilled before cutting and decorating . Cut each cake, evening off at the top by cutting off the round tops and making them flat. Then cut into two even rounds. ( in half) Now you should have 4 cake rounds. Beat the butter and cream cheese till light and fluffy. Add the cooled chocolate, vanilla and the icing sugar and beat till light and fluffy. Divide into 4 bowls. I coloured 3 shades of yellow and 1 a light pink. You make the colours you want or no colours at all. Put down the first round onto a cake plate and paint with the strawberry jam. Then cover with 1/4 of the strawberry coloured buttercream filling. Continue this until the last round. If you have strawberry jam left paint the cake with it just to hold some of those crumbs to the cake. Start to buttercream the cake with the remaining buttercream you have. 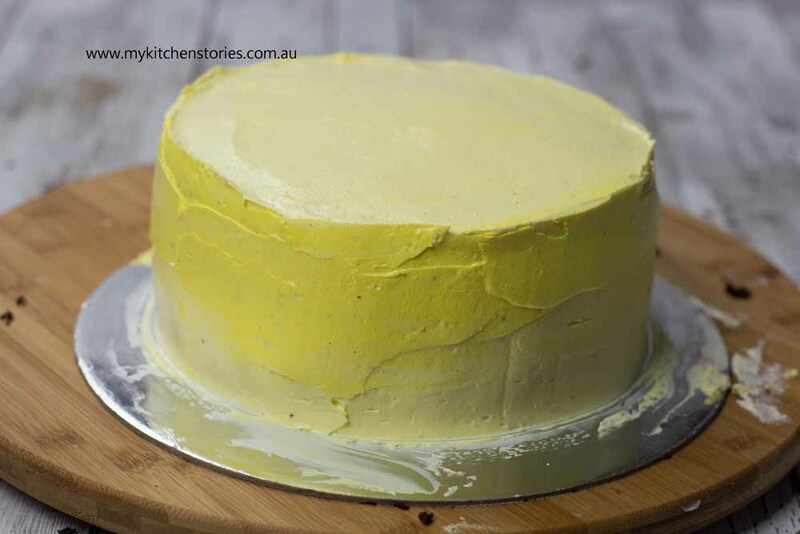 If making an ombre cake start with a light colour and smooth over before starting with the next colour in the space up from the last. Finish with the darkest colour then run a knife around the whole cake taking off any excess and smoothing over. Looks so very beautiful and festive! I love that vibrant color of frosting… Lovely presentation…. Hi Priya, thanks happy cooking! I do love a one bowl cake recipe. Love how chirpy this looks in a sunny shade of yellow. wow, what a gorgeous cake this is? 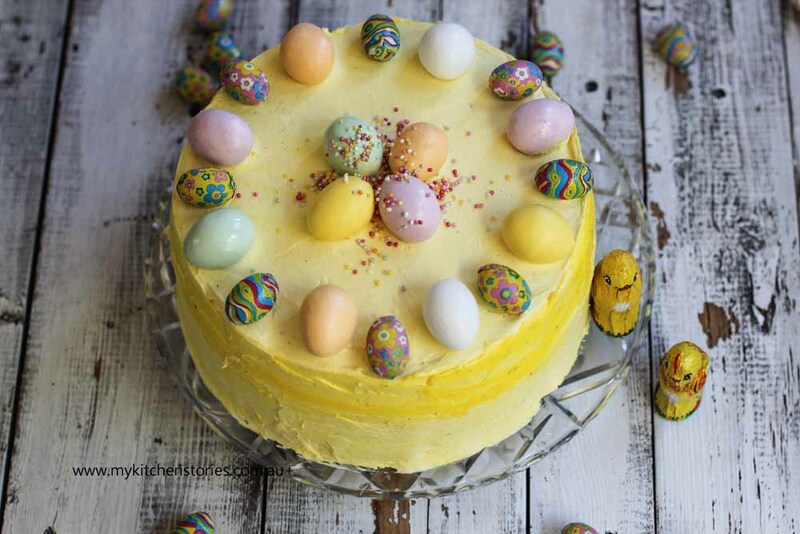 Perfect for Easter celebration. 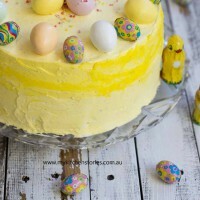 Easter certainly brings out the best in you bakers, Tania. This cake is lovely and so fitting for the holiday. It would be a hit for kids of all ages.